Summary: I love this walk so much that when I first discovered it I resolved to walk it again in the company of my wife who, while not being the most enthusiastic walker, would love it. And love it she did when I went back with her just one year later for the walk which while not the longest in relative distance of my walks has three distinct parts which all contribute to a wonderful walking experience. First there is the walk along the beach which is delightful with firm unadulterated sands making the walking easy. 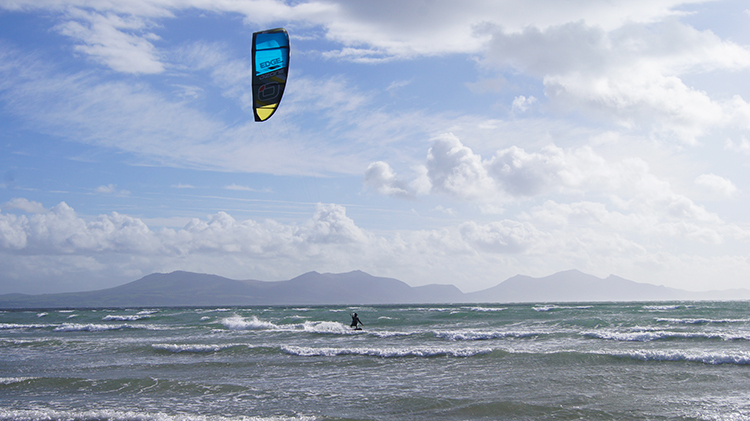 Next there is the fascinating exploration of Llanddwyn Island with the history of settlement and the natural wonders to be discovered both captivating ones attention. Finally there is the walk back on the forest trails which feels much more protective of the elements than the wild exposure of the sands and island though you are only a few steps away from the coast and the sea. Altogether these elements make this one of the most alluring coastal walks I have ever experienced. The Walk: I had wanted to visit the Isle of Anglesey for some time. While I was a frequent visitor to Wales I had always headed for the big mountains of Snowdonia, the big hills of the Cambrians or the icons of the Brecon Beacons. This time I had encamped myself in a static caravan on a Snowdonia site between Bedgellert and Porthmadog for a week and while I had planned some mountain walks such as Snowdon, Moel Hebog and the Y Garn/ Devil's Kitchen round I had also planned a couple of walks on Anglesey as well. This was the first one, having had it recommended to me by friends and by followers of the website. All had enthused about the walk. So off I went to find out for myself. It was 29th September and while summer had crossed to the southern hemisphere it seemed as if it was still here. The sky was full of blue and the air was warm. In fact it was the most gorgeous t-shirt weather, so much nicer than most we had experienced in high summer. After I had paid the toll fee to enter the expansive nature reserve, £4 (2016 and 2017), and parked up I climbed over the humped grassed sand bank to spot Newborough Beach. I was immediately awestruck by its beauty. 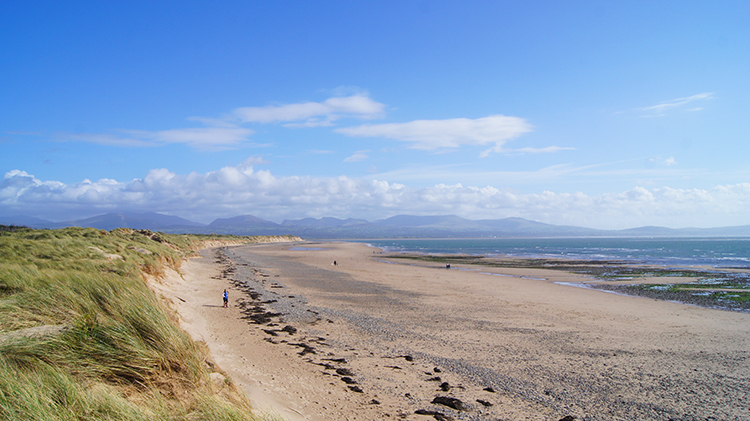 First I looked south along the sands and across Caernarfon Bay to view the outline of the Snowdonia range. Then I turned my head in a sweep from south to northwest and looking along the sands across Llanddwyn Bay to the promontory jutting out to sea which was in fact Llanddwyn Island. "WOW, this is magic". From Porth y Cwch I followed the coastline and looked across to the small island outcrop of Ynys y Clochydd where a colony of Shags had set up home. They constantly keep vigil on the rocks looking all around to sight any intruders. Or perhaps they are just curious about all going on around them such as the sight of humans bobbing up and down on the paths of Llanddwyn Island. Maybe they found my head bobbing up and down as I walked as funny as I found theirs doing the same. I came to some cliffs after walking the sands adjacent to Ynys y Clochydd. While a couple who had been ahead of me had climbed a path from the shore I took the less easy route of scrambling around the cliffs a while before scrambling up from them. The rocks were hard and some jagged edges cut by constant battering from the sea were very sharp. In my endeavour to be adventurous and while waves were clattering the cliff and spraying me I cut my hand while trying to climb from the soaking I was getting. I also slipped and knocked my camera. Though I did not know it at the time I had damaged my camera lens. It was an expensive adventure. Eventually I worked out a safe route up the cliff and scrambled up safely. "Daft sod" was my immediate thought. "Why not, if it is there do it" was my afterthought. With breath recovered I carried on to begin my exploration of the island. I looked around the scene set before me and thought "This is so beautiful". The whitewashed structure of Tŵr Bach lighthouse drew me in first. It was the closest man made structure and though I had to cross a sea wall to get to it I was not leaving it out of close company. 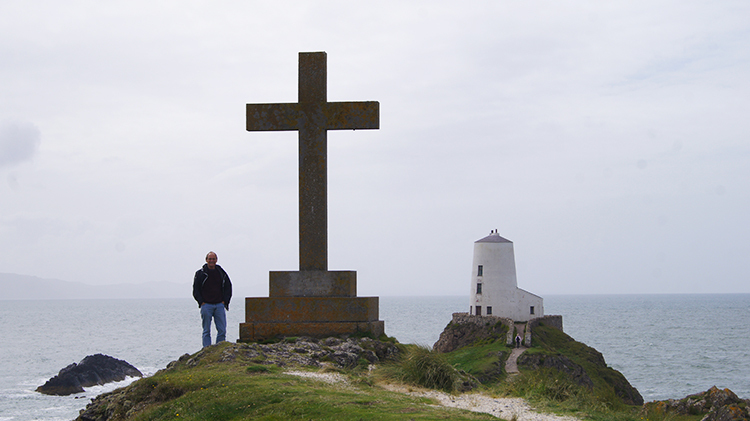 I made my way across and stood by the smaller of the two lighthouses on Llanddwyn Island. Though named a lighthouse it is in fact a beacon to provide guidance to ships heading for the Menai Strait. I made my way from Tŵr Bach Beacon to Tŵr Mawr lighthouse which stands high and proud on a natural castle of land, a site of mythical appearance. Tŵr Mawr, which was modelled on the windmills of Anglesey, was built in 1845 and though it originally replaced Tŵr Bach both now work in harmony, Tŵr Bach having a modern beacon placed on top of the structure and returned into service. 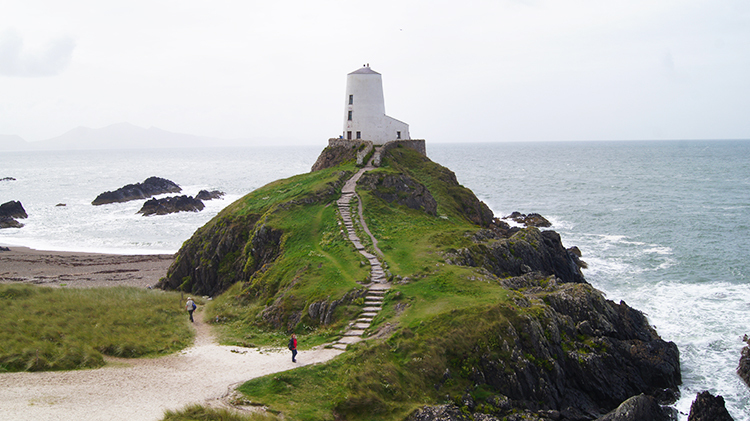 From the higher height of Tŵr Mawr lighthouse though there is not only an impressive view out to sea and to the coast of Wales but also back along the breast of Llanddwyn Island. It sure is a place to rest and contemplate and as such it was one of the places I showed Lil to on my return. She fell for the charm and magic of the place as much as I had that first time. This walk takes much longer than it should and that is because there is so much to do and so much to see. It is not a walk to be rushed. 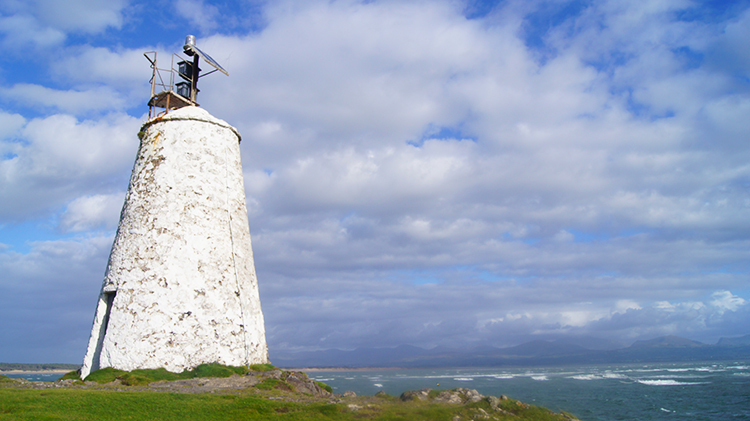 As was the case with the visits to the beacon and lighthouse Llanddwyn Island continued to give. 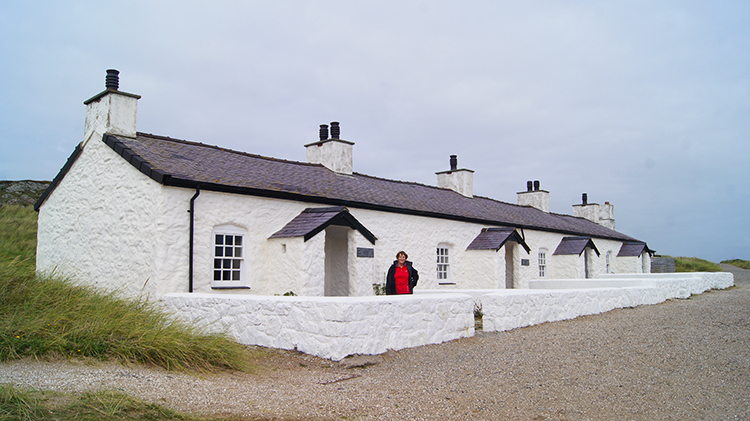 The first time I had visited I had admired the view and the pristine whitewashed appearance of the Pilot's cottages on the island which are just a short distance inland from the castellated mound of Tŵr Mawr. On my return with Lil we were provided with the gift of going inside the cottages to view what the conditions of life for the Pilot's and their families will have been on the island. Storyboards also explained the habitation history of the island from the earliest religious settlers through to modern times. From the Pilot's Cottages the walk from the island begins, first by climbing to a second raised piece of land where a plain cross stands. Inscriptions on the cross read "Dwynwen; in the sixtieth year of Queen Victoria 1897"; "in memory of St Dwynwen Jan 25th 1465"; and, "erected by the Hon F G Wynn owner of the isle". 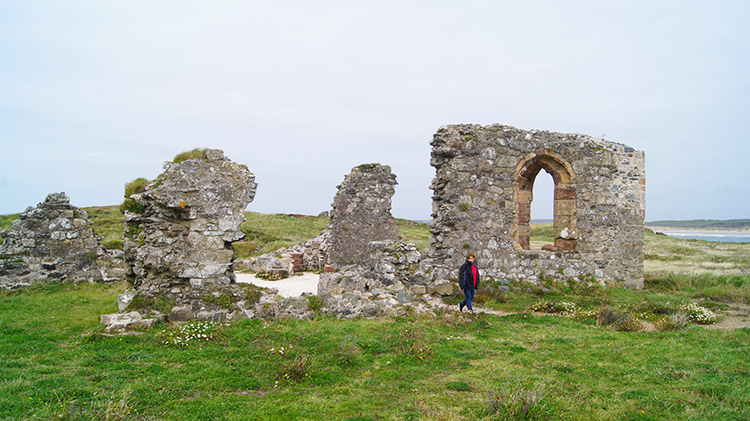 It is a short walk north from the cross to the site of an old church, now an evocative ruin. 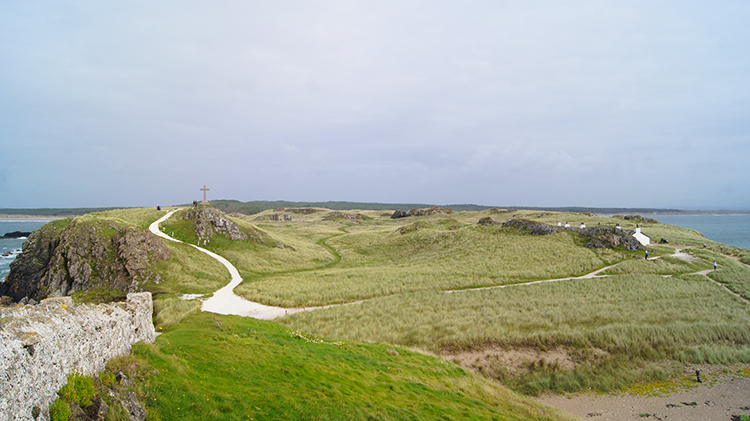 It is St Dwynwen's Church who spent much of her later life in Llanddwyn Island. 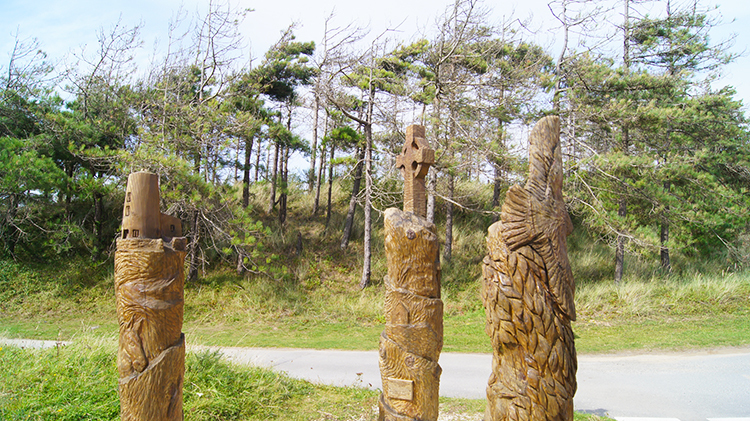 St Dwynwen is the Welsh Patron Saint of Lovers and is celebrated throughout Wales on 25 January. 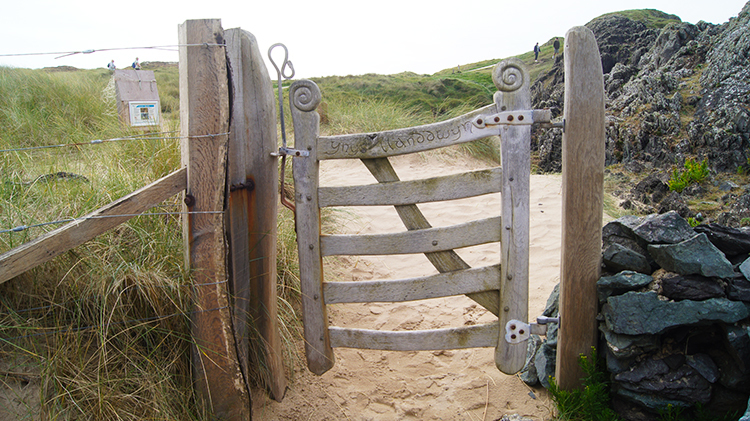 So that is why Llanddwyn Island feels so romantic. That is so apt, it is such a romantic place in what I now realise is a romantic setting. Many people who were walking the island were sticking to the paths along the spine and not exploring the quiet coves on the east and west sides. I had to explore some of them and I recommend you do too. They are so delightful and quite dramatic too with waves crashing in over the small defensive natural outcrops. Particularly so on the west shore facing out to the expanse of Malltraeth Bay. 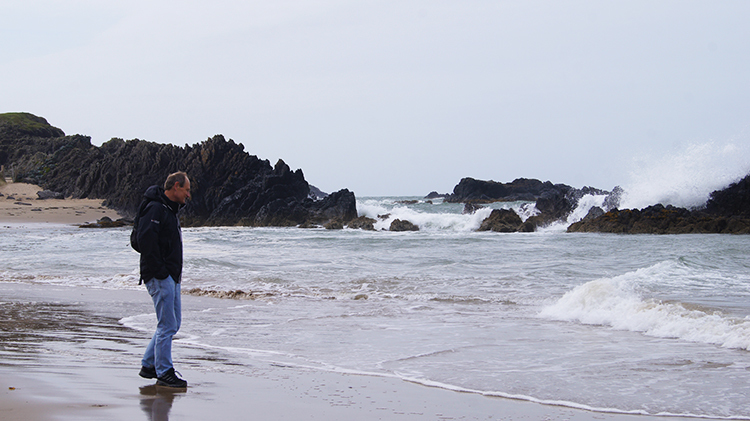 I went down to one particular cove the first time I visited and again on my return with Lil. I stayed for quite a while watching the natural entertainment and I could easily have stayed much longer. 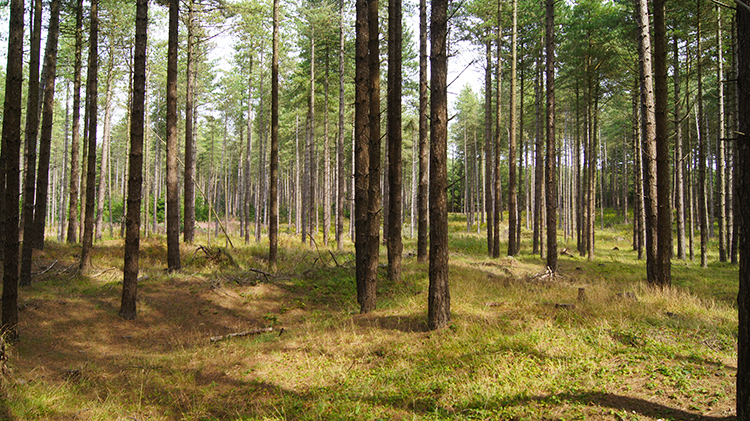 After fifteen enjoyable minutes of walking through the forest and after five minutes of fun trying to emulate a gymnast by swinging on parallel bars sited in the forest for fun the walk was done. Twice done in fact and entirely pleasurable both times. 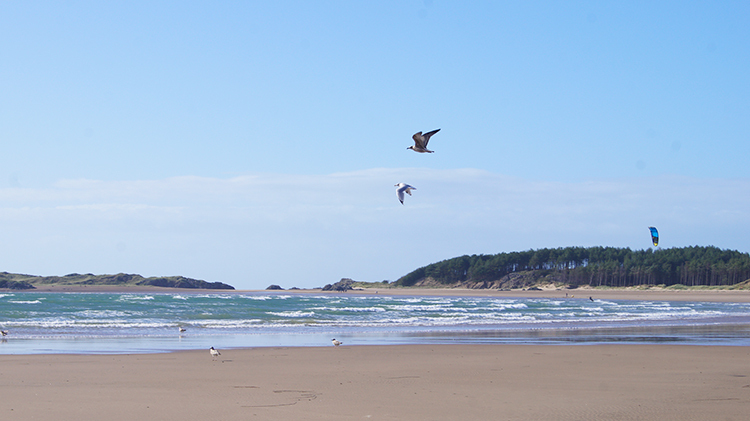 Newborough Beach is beautiful. 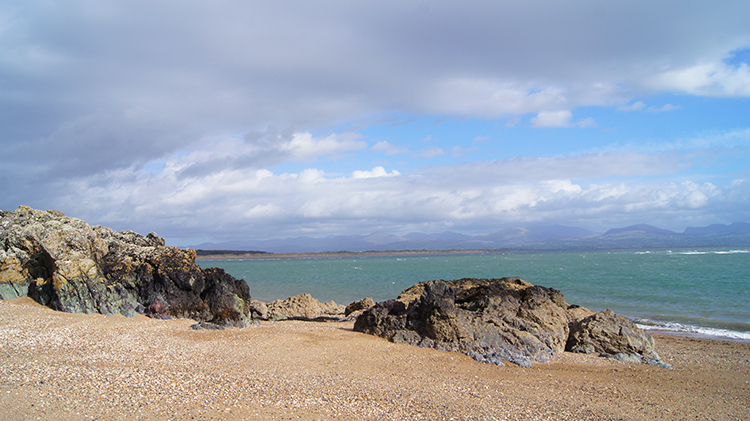 Llanddwyn Island is a very special place. And the walk back from them is not too bad either.